Summary:Once you make the decision to move ahead and build or update your church website, you need to choose the platform you will build it with. What are your choices and how will you make the decisions you are faced with? Here's a look at a baker's dozen of top content management systems and how they compare for church websites and how should you evaluate them. If you've looked around for a content management system, it is obvious there are 3 big players and then hundreds, if not thousands, of others. Drupal, Joomla! and WordPress have been dominating the CMS arena for several years, but that doesn't mean they are the only tools in the toolbox. As with all tools, the one you select depends on the problems you are trying to solve and the skills you possess. First of all, how did I come up with the list? Opensource software provides users with options for modifying and distributing software. In many cases, you can obtain the software at no cost. And, if it isn't exactly what you are looking for, you can modifiy it yourself, or find someone to modify it for you. Opensource also has a pretty good return on investment - the majority of the applications are free, or have free versions, that you can use without any charge or any other licensing restrictions. Where the costs come in is hiring help for custom development or support, if needed. Which other resources (mostly technical)? In a previous article, I also looked at what church denominations were using and recommending to guide my searching for CMS resources. In order to select a content management system, you first need to find it. The primary tool for finding something online is a search engine, like Google, Bing, or Yahoo! To learn about anything, you can type in a search and, based on the number and quality of results, begin to form some opinions. To be effective, a search needs to be well-defined. A general search for 'church website' will yield millions of results and get you no closer to making a decision than you were before you started. In fact, you will probably be just as confused, only on a deeper level. So, to make your search more effective, you need to know what problems you are trying to solve. How often will the content be updated? What experience do the people updating the site have? What types of content will you be placing on your site? As you define more clearly these requirements, you can refine your search by adding more terms to your query. For the purpose of this article, we are taking a broad brush approach and using 'for churches', 'churches', 'church', 'christian' and 'christian resources' in conbination with the CMS (content management system) name. 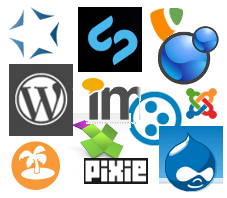 Which content management systems made the list for using for your church website? As mentioned above, Drupal, Joomla! and Wordpress are definitely on the list. I also added 10 additional systems to give you a baker's dozen - CMS Made Simple, Concrete5, DotNetNuke, ImpressCMS, MODx, Pixie, Pligg, Silverstripe, Typo3 and XOOPS. There were 2 systems that were on the list temporarily, but were eliminated because they failed to meet all the requirments satisfactorily. Mambo because it is no longer being actively maintained and Plone was eliminated because the server requirements were a little steep and not readily available. In addition to these options, there are several church- and ministry-specific hosted platforms you can consider. With those, you'll pay a monthly fee for hosting your site and you'll be provided with a 'website builder'. Their servers, their platform, your site. It has some merits, but also some limitations, we'll cover those in a future article. Let's get to the task, shall we? The Summary: Which CMS For Your Church?